review There really isn’t much to say about Brandon Sanderson’s The Well of Ascension, the 2007 follow-up to his highly satisfying 2006 novel Mistborn. 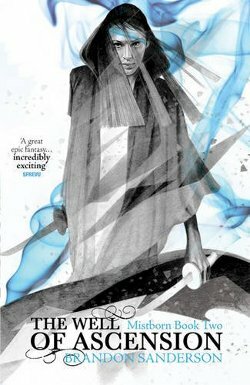 If you liked your first venture into the Mistborn universe, and our review suggests that you probably did, you’ll love the second instalment. Note: This review of the second book in the Mistborn series contains spoilers about the first. You probably don’t want to read The Well of Ascension or this review before you read the first book, The Final Empire. In fact, you’ll probably snarl at anyone – for example, your boss, the bus conductor, your spouse – who tries to get you to stop reading it and pay attention to the real world. It’s that good. It’s simply a little nugget of fantasy gold that we couldn’t put down for the week it took to read it. The narrative of The Well of Ascension kicks off a little after the events of The Final Empire. Arch-rebel Kelsier has died after successfully lighting a fire under the government and nobility of the city of Luthadel, at the heart of the empire. But then the Lord Ruler, that virtually immortal emperor who took the power of the legendary and mysterious Well of Ascension millennia ago and has been abusing his power ever since, has also been knocked off. His killer, the street thief turned powerful Allomancer Vin, is now hanging out with her boyfriend, the noble Elend Venture, who has taken the reins of power and kingship in the city of Luthadel at the centre of the empire. Allomancy, if you remember, is Mistborn’s magic system. Its practitioners can ‘burn’ certain metals after swallowing them, gaining amazing powers of strength, sensory enhancements and metal manipulation in doing so. It all sounds hunky dory. Ding dong, the Lord Ruler is dead, let’s dance happily on the ashes of his grave and end the servitude of the Skaa, the peasant class in the world of Mistborn. But of course, nobody ever got to live happily ever after in the second book of a trilogy. One of the refreshing things about the Mistborn series so far is its focus (thus far) on just one location. This is no quest series, where a legendary magical item has to be returned to the receptacle from which it was stolen 2,000 years ago by the Dark Lord and his evil minions etc. In fact, as with the first book, almost all of the events in The Well of Ascension take place in the city of Luthadel. We follow Vin around most of the time as she deals with those attempting to kill Elend Venture and starts to realise that even though she’s one of the most advanced Allomancers around, she really doesn’t know that much about the real history of her powers and the world she lives in. As the book wears on, it takes a turn for the disastrous. As its blurb notes, no less than three separate armies arrive outside the city walls and dig in for a siege. But that’s not all. The Lord Ruler might be gone, but there are other supernatural forces out there, and some of them begin to pay Vin regular visits. Hints begin to arrive that Vin and Elend Venture’s problems might not just restricted to the political chaos following the Lord Ruler’s death, but might extend to instabilities in the deep structure of the entire world and its magic system. There is plenty of action in The Well of Ascension, and plenty of “aha” moments where small or large secrets and plot elements are revealed to the reader for the first time. Normally the middle book in a trilogy is the toughest one to get right, but Sanderson’s work fires on all cylinders. The author never makes the mistake of letting his characters get too powerful or too ahead of themselves. The minute they do, some larger problem arrives to cut them down to size and put a realistic cap on their abilities. I have but two criticisms of The Well of Ascension, and they are minor ones. Firstly, the political manoeuvring is a little bit naïve and simplistic. Most of the time it simply contrasts the idealism of Elend Venture with the crass greed and powermongering of the other powerful players. However, real-world politics is a great deal more complicated and often plays different sets of ideals against each other. Most of the Mistborn world is coloured in shades of grey, but its politics is simply black and white. Secondly, I would argue that certain aspects of Sanderson’s plot in general is predictable. That doesn’t mean it’s not enjoyable to take in, but the more experienced fantasy reader will pick up the more obvious signs he leaves scattered throughout the book as to the real story behind the surface events in The Well of Ascension. But these two minor quibbles won’t keep anyone continuing their journey in this highly enjoyable series. If you liked The Final Empire, you’ll want to pick up The Well of Ascension quick smart and block out a sizeable chunk of space in your diary for “personal time”. Renai LeMay is an Australian writer and technologist. All content on this site is copyrighted to Renai, unless otherwise noted. Book cover images are copyrighted to their respective publishers/authors and are used for the fair use purpose of review.